Squeezing a 30-minute run into your schedule several times a week might require you to juggle your schedule, but your body will thank you. This simple exercise can help boost your health and fitness level in a number of ways. The number of calories you'll burn throughout the course of the half-hour run depends on several variables. Always consult your doctor before starting this or any exercise regimen. In general, heavier people burn calories at an elevated rate compared to lighter people. As such, a heavier person will burn more calories than a lighter person when the two people run for 30 minutes at the same speed. According to the website HealthStatus, a person who weighs 135 pounds burns 259 calories during a 30-minute run at 5 mph. A person who weighs 175 pounds, however, burns 336 calories during a run of the same speed and duration. Cardio exercise at any intensity can potentially provide a wealth of benefits for your health, but the faster you run during your 30-minute workout, the more calories you'll have burned by the time you unlace your shoes. A 135-pound person will burn 308 calories during a 30-minute run at 6 mph, 352 calories upon increasing her speed to 7 mph and 413 calories if she averages 8 mph during the half-hour run. 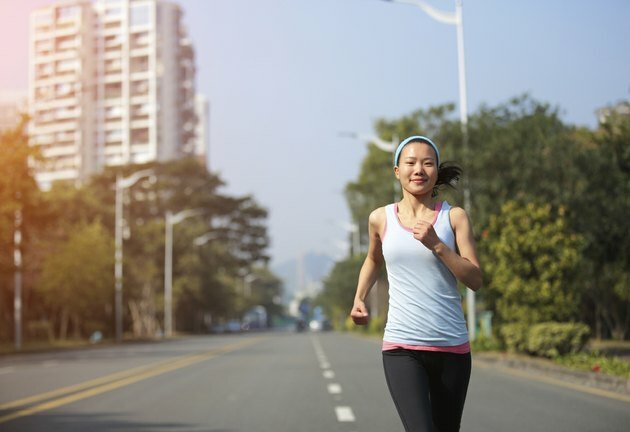 A variety of other factors can influence the rate at which you burn calories during your half-hour run. If you spend a significant amount of time running uphill, you'll burn more calories than you would on a run of the same length over even ground. Conversely, a downhill run won't burn quite as many calories. You can also boost your calorie burn by wearing light ankle or wrist weights; the American Council on Exercise reports using 1- to 3-pound wrist weights during cardio can increase your calorie burn by up to 15 percent. The burning of calories is closely tied with weight loss, and if you're able to take a 30-minute run several times per week, you'll increase your chance of losing weight. In general, aiming for 300 minutes of cardio per week can lead to weight loss, but performing some strength training and watching your intake of calories are also important. To lose a pound of fat per week, you must burn an average of 500 calories more than you consume every day.